Botanica Lakes is a community Fort Myers located near the airport and within a couple of miles of the new Boston Red Sox Spring Training facility. 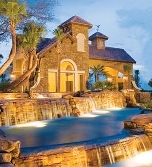 Botanica Lakes features over 100 acres of open space and natural preserves and 32 acres of lakes. Open to people of all ages. Mediterranean style single-family homes priced from the $170's. Amenities include a courtyard-style clubhouse and 7-acre recreation area that features a fitness center, children's activity center, yoga and exercise studio, resort-style pool, a water play area, tennis, and basketball courts.